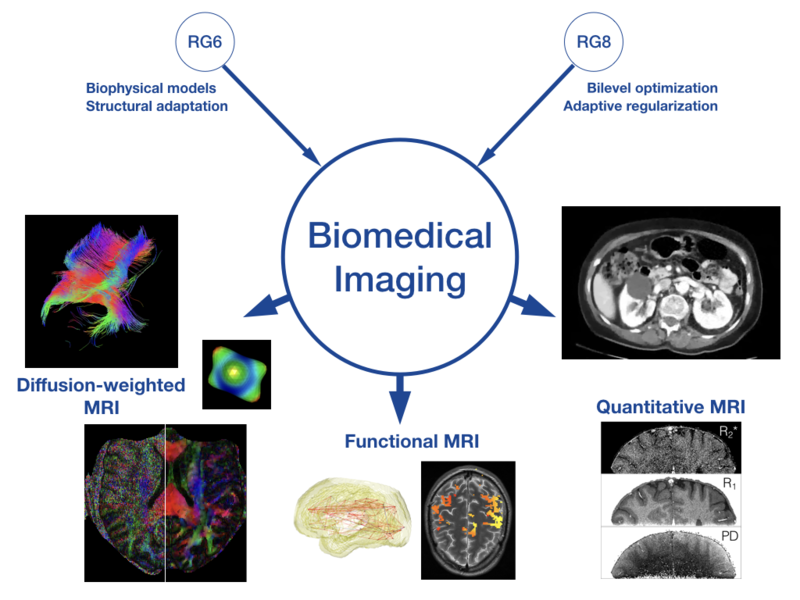 This project is concerned with biomedical images often with applications to Magnetic Resonance Imaging (MRI) problem, ranging from functional, diffusion-weighted, quantitative MRI to image reconstruction in Magnetic Resonance Fingerprinting. The methods developed in this project arise from different areas of mathematics specifically from non-parametric statistics and non-smooth variational methods. Images are often characterized by qualitative properties of their spatial structure, e.g. spatially extended regions of homogeneity that are separated by discontinuities. Images or image data with such a property are the target of the methods considered in this research. The methods summarized under the term structural adaptive smoothing try to employ a qualitative assumption on the spatial structure of the data. This assumption is used to simultaneously describe the structure and efficiently estimate parameters like image intensities. Structural adaptive smoothing generalizes several concepts in non-parametric regression. The methods are designed to provide intrinsic balance between variability and bias of the reconstruction results. A first attempt to use the idea of structural adaptive smoothing for image processing was proposed in Polzehl and Spokoiny (2000) under the name adaptive weights smoothing. This was generalized and refined especially in Polzehl and Spokoiny (2006) providing a theory for the case of one-parameter exponential families. This has become known under the name propagation-separation approach. Several extentions have been made to cover locally smooth images, color images (Polzehl and Tabelow, 2007) and applications from the neurosciences like functional Magnetic Resonance Imaging (fMRI) and diffusion-weighted Magnetic Resonance Imaging (dMRI). Non-smooth variational (energy minimizing) models form a powerful tool for addressing inverse medical imaging problems. The idea is to obtain the image reconstruction by inverting the operator which models a given medical imaging modality in a stable and robust way. Examples of such operators are the Radon transform for Positron Emission Tomography (PET) and a subsampling operator of a signal's Fourier coefficients for Magnetic Resonance Imaging (MRI). This inversion is typically an ill-posed problem and it is further complicated by the presence of random noise. Therefore, a Tikhonov regularization approach is employed where some a priori information in encoded in the regularization term. For a stable inversion, non-smooth regularisers, e.g. of Total Variation (TV) type, are popular due to their ablilty to preserve prominent features in the reconstruction (edges). The choice of the right regularizer is crucial as this is closely linked to exploiting the a priori information in a meaningful way. The choice and adaptation of the regularization weight must be finely tuned. This determines the amount of regularization (filtering) that is applied locally. An analysis in function space is of high importance. This provides an understanding of the regularizing mechanisms independently of discretization artifacts while it sets up the framework for the design of solution algorithms in function space which exhibit resolution independent convergence behaviour. In a series of publications we develop dedicated methods for noise reduction and signal inference in functional MRI based on the propagation-separation approach: In Tabelow et al. 2006 we proposed a new adaptive method for noise reduction of the statistical parametric map in a single-subject fMRI dataset. The properties of this map after smoothing allow for the application of Random Field theory for signal detection. We demonstrated that the method is able to recover the signal-to-noise loss when increasing the spatial resolution of the MRI acquisition (Tabelow et al. 2009) and its applicability for pre-surgical planning (Tabelow et al. 2008). Later, we were able to include the signal detection into a coherent statistical framework for adaptive fMRI analysis in a structural adaptive segmentation method (Polzehl et al. 2010), see Figure 1. All adaptive methods for fMRI are implemented in the R software environment for statistical computing and graphics as a free contributed package fmri. It can be downloaded from the CRAN server. It is also listed at NITRC and part of the WIAS R packages for neuroimaging. The structural adaptive segmentation algorithm is available as Adaptive Smoothing Plugin for the neuroimaging software BrainVoyager QX. Figure 1. - Signal detection in a single-subject finger-tapping experiment using (Left to right) a) standard Gaussian filter b) structural adaptive smoothing and Random field theory (RFT) (Tabelow et al. 2006), c) structural adaptive segmentation (Polzehl et al. 2010). Figure 2. - A slice of the fractional anisotropy (FA) map obtained in DTI. Move the yellow slider with the mouse pointer to switch between the original noisy map and the result after denoising with msPOAS (Becker et. al 2012). The signal attenuation by the diffusion weighting in dMRI makes this imaging modality vulnerable to noise. We developed a structural adaptive smoothing method for Diffusion Tensor Imaging data (Tabelow et al. 2008; Polzehl and Tabelow 2009). The method uses local comparisons of the estimated diffusion tensor to define the local homogeneity regions for the propagation-separation approach. We developed a position-orientation adaptive smoothing algorithm for denoising of diffusion-weigthed MR data (POAS). This algorithm works in the orientation space of the measurement and does not refer to a model for the spherical distribution of the data like the diffusion tensor (Becker et. al 2012). Recently, the method could be extended for multi-shell dMRI data as multi-shell POAS (msPOAS) (Becker et al. 2014), see Figure 2. All adaptive methods for dMRI are implemented in the R software environment for statistical computing and graphics as a free contributed package dti. It can be downloaded from the CRAN server. It is also listed at NITRC and part of the WIAS R packages for neuroimaging. The msPOAS method is also implemented in Matlab as part on the ACID-Toolbox for SPM (Tabelow et al. 2015). The method has shown to be an essential part of an improved processing pipeline for Diffusion Kurtosis Imaging (DKI) in Mohammadi et al. 2015. The application of many processing methods to neuroimaging data, like the denoising method msPOAS, requires knowledge on the (local) noise level in the data. In Tabelow et al. 2015 we provide a new method LANE for the corresponding estimation problem. The knowledge about the local noise level then also allows for the characterization of the estimation bias in local diffusion models (Polzehl and Tabelow 2016), which is in particular important at low SNR. The R package dti is capable of performing a full analysis of dMRI data and implements a large number of diffusion models for the data, e.g. the DTI model, the diffusion kurtosis model (DKI), and the orientation distribution function. We proposed a computationally feasible and interpretable tensor mixture model for the modelling of dMRI data (Tabelow et al. 2012). 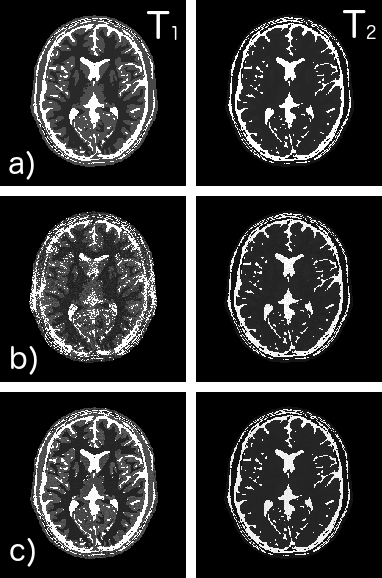 The importance of adequate processing of neuroimaging data for diagnostic sensitivity became obvious in two publications together with colleagues from Universitätsklinikum Münster concerning multiple sclerosis (Deppe et al. 2016) and EHEC (Krämer et al. 2015). In a series of papers (Hintermüller and Rautenberg 2017, Hintermüller et al. 2017, Hintermüller, Papafitsoros, and Rautenberg 2017, Hintermüller et al. 2017b), a new generalized formulation of the renowned total variation regularization was introduced and analyzed. The new regularization functional incorporates a distributed weight function which allows for a varying filter effect depending on local image features (details vs. homogeneous regions). The filter weight is determined automatically through a novel bilevel optimization framework (Hintermüller and Rautenberg 2017, Hintermüller et al. 2017). In this context, the parameterized image reconstruction problem represents the lower level problem, and the upper level problem aims at fixing the filter weight properly. Inspired by an unsupervised learning approach and the statistics of extremes, a localized variance corridor for the image residual is considered and its violation provides a suitable choice for the upper level objective. In the case of Parseval frames, an algorithmic alternative was discussed in Hintermüller et al. 2017b, where instead of the regularizing term, the data fidelity term was weighted and the algorithmic optimization was performed with a surrogate technique. Finally, a detailed study concerning analytical properties of the novel total variation generalization was presented in Hintermüller, Papafitsoros, and Rautenberg 2017. Figure 3. - Solutions to a problem of Fourier inpainting arising in parallel magnetic resonance imaging of a chest, where the data are restored by known methods utilizing a) backprojection or b) a scalar weight as well as c) the bilevel approach (from left to right). The spatial distribution of the weight allows to better handle local properties, i.e. homogeneous and detailed regions (subfigure d)). Figure 4. - Example where there the structural TV functional is appropriately tuned to promote edge alignment of a PET reconstruction to an already reconstructed MRI image. As a result, the edges in the PET reconstruction are more enhanced. Mathematical characterization of the MRF process by performing analysis in function space. Further improvement of the quality of the reconstruction of the parameter maps by employing modern non-smooth regularization techniques in the MRF process, see preliminary results in Figure 5. Development of efficient reconstruction algorithms for MRF. Figure 5. - Preliminary results on improving the quality of MRF reconstruction. a) Ground truth, b) MRF reconstruction, c) regularized MRF. Left: T1 map, Right: T2 map. Many of the image processing tools especially in the context of neuroimaging are developed in the MATHEON project F10 "Image and signal processing in the biomedical sciences". The research activity of many international groups with respect to R and Medical Imaging has been recently summarized in a Special Volume of the Journal of Statistical Software "Magnetic Resonance Imaging in R" vol. 44 (2011) edited by K. Tabelow and B. Whitcher, see also Tabelow et al. 2011. K. Tabelow, B. Whitcher, eds., Magnetic Resonance Imaging in R, 44 of Journal of Statistical Software, American Statistical Association, 2011, 320 pages, (Monograph Published). In this paper we study the structure of solutions of the one dimensional weighted total variation regularisation problem, motivated by its application in signal recovery tasks. We study in depth the relationship between the weight function and the creation of new discontinuities in the solution. A partial semigroup property relating the weight function and the solution is shown and analytic solutions for simply data functions are computed. We prove that the weighted total variation minimisation problem is well-posed even in the case of vanishing weight function, despite the lack of coercivity. This is based on the fact that the total variation of the solution is bounded by the total variation of the data, a result that it also shown here. Finally the relationship to the corresponding weighted fidelity problem is explored, showing that the two problems can produce completely different solutions even for very simple data functions. In this paper we address density properties of intersections of convex sets in several function spaces. Using the concept of Gamma-convergence, it is shown in a general framework, how these density issues naturally arise from the regularization, discretization or dualization of constrained optimization problems and from perturbed variational inequalities. A variety of density results (and counterexamples) for pointwise constraints in Sobolev spaces are presented and the corresponding regularity requirements on the upper bound are identified. The results are further discussed in the context of finite element discretizations of sets associated to convex constraints. Finally, two applications are provided, which include elasto-plasticity and image restoration problems. M. Deppe, K. Tabelow, J. Krämer, J.-G. Tenberge, P. Schiffler, S. Bittner, W. Schwindt, F. Zipp, H. Wiendl, S.G. Meuth, Evidence for early, non-lesional cerebellar damage in patients with multiple sclerosis: DTI measures correlate with disability, atrophy, and disease duration, Multiple Sclerosis Journal, 22 (2016), pp. 73--84, DOI 10.1177/1352458515579439 . K. Schildknecht, K. Tabelow, Th. Dickhaus, More specific signal detection in functional magnetic resonance imaging by false discovery rate control for hierarchically structured systems of hypotheses, PLOS ONE, 11 (2016), pp. e0149016/1--e0149016/21, DOI 10.1371/journal.pone.0149016 . H.U. Voss, J.P. Dyke, K. Tabelow, N. Schiff, D. Ballon, Magnetic resonance advection imaging of cerebrovascular pulse dynamics, Journal of Cerebral Blood Flow and Metabolism, 37 (2017), pp. 1223--1235 (published online on 24.05.2016), DOI 10.1177/0271678x16651449 . J. Krämer, M. Deppe, K. Göbel, K. Tabelow, H. Wiendl, S.G. Meuth, Recovery of thalamic microstructural damage after Shiga toxin 2-associated hemolytic-uremic syndrome, Journal of the Neurological Sciences, 356 (2015), pp. 175--183. Although spatial smoothing of fMRI data can serve multiple purposes, increasing the sensitivity of activation detection is probably its greatest benefit. However, this increased detection power comes with a loss of specificity when non-adaptive smoothing (i.e. the standard in most software packages) is used. Simulation studies and analysis of experimental data was performed using the R packages neuRosim and fmri. In these studies, we systematically investigated the effect of spatial smoothing on the power and number of false positives in two particular cases that are often encountered in fMRI research: (1) Single condition activation detection for regions that differ in size, and (2) multiple condition activation detection for neighbouring regions. Our results demonstrate that adaptive smoothing is superior in both cases because less false positives are introduced by the spatial smoothing process compared to standard Gaussian smoothing or FDR inference of unsmoothed data. J. Bardin, J. Fins, D. Katz, J. Hersh, L. Heier, K. Tabelow, J. Dyke, D. Ballon, N. Schiff, H. Voss, Dissociations between behavioral and fMRI-based evaluations of cognitive function after brain injury, Brain, 134 (2011), pp. 769--782. Functional neuroimaging methods hold promise for the identification of cognitive function and communication capacity in some severely brain-injured patients who may not retain sufficient motor function to demonstrate their abilities. We studied seven severely brain-injured patients and a control group of 14 subjects using a novel hierarchical functional magnetic resonance imaging assessment utilizing mental imagery responses. Whereas the control group showed consistent and accurate (for communication) blood-oxygen-level-dependent responses without exception, the brain-injured subjects showed a wide variation in the correlation of blood-oxygen-level-dependent responses and overt behavioural responses. Specifically, the brain-injured subjects dissociated bedside and functional magnetic resonance imaging-based command following and communication capabilities. These observations reveal significant challenges in developing validated functional magnetic resonance imaging-based methods for clinical use and raise interesting questions about underlying brain function assayed using these methods in brain-injured subjects. V. Katkovnik, V. Spokoiny, Spatially adaptive estimation via fitted local likelihood techniques, IEEE Transactions on Signal Processing, 56 (2008), pp. 873--886. This paper offers a new technique for spatially adaptive estimation. The local likelihood is exploited for nonparametric modelling of observations and estimated signals. The approach is based on the assumption of a local homogeneity of the signal: for every point there exists a neighborhood in which the signal can be well approximated by a constant. The fitted local likelihood statistics is used for selection of an adaptive size of this neighborhood. The algorithm is developed for quite a general class of observations subject to the exponential distribution. The estimated signal can be uni- and multivariable. We demonstrate a good performance of the new algorithm for Poissonian image denoising and compare of the new method versus the intersection of confidence interval (ICI) technique that also exploits a selection of an adaptive neighborhood for estimation. O. Minet, H. Gajewski, J.A. Griepentrog, J. Beuthan, The analysis of laser light scattering during rheumatoid arthritis by image segmentation, Laser Physics Letters, 4 (2007), pp. 604--610. G. Blanchard, M. Kawanabe, M. Sugiyama, V. Spokoiny, K.-R. Müller, In search of non-Gaussian components of a high-dimensional distribution, Journal of Machine Learning Research (JMLR). MIT Press, Cambridge, MA. English, English abstracts., 7 (2006), pp. 247--282. Finding non-Gaussian components of high-dimensional data is an important preprocessing step for efficient information processing. This article proposes a new em linear method to identify the “non-Gaussian subspace” within a very general semi-parametric framework. Our proposed method, called NGCA (Non-Gaussian Component Analysis), is essentially based on the fact that we can construct a linear operator which, to any arbitrary nonlinear (smooth) function, associates a vector which belongs to the low dimensional non-Gaussian target subspace up to an estimation error. By applying this operator to a family of different nonlinear functions, one obtains a family of different vectors lying in a vicinity of the target space. As a final step, the target space itself is estimated by applying PCA to this family of vectors. We show that this procedure is consistent in the sense that the estimaton error tends to zero at a parametric rate, uniformly over the family. Numerical examples demonstrate the usefulness of our method. H. Gajewski, J.A. Griepentrog, A descent method for the free energy of multicomponent systems, Discrete and Continuous Dynamical Systems, 15 (2006), pp. 505--528. J. Griepentrog, On the unique solvability of a nonlocal phase separation problem for multicomponent systems, Banach Center Publications, 66 (2004), pp. 153-164. M. Hintermüller, A. Langer, C.N. Rautenberg, T. Wu, Adaptive regularization for image reconstruction from subsampled data, in: Imaging, Vision and Learning Based on Optimization and PDEs IVLOPDE, Bergen, Norway, August 29 - September 2, 2016, X.-Ch. Tai, E. Bae, M. Lysaker, eds., Mathematics and Visualization, Springer International Publishing, Berlin, 2018, pp. Part 1, Chapter 1, 23 pages, DOI 10.1007/978-3-319-91274-5 . Choices of regularization parameters are central to variational methods for image restoration. In this paper, a spatially adaptive (or distributed) regularization scheme is developed based on localized residuals, which properly balances the regularization weight between regions containing image details and homogeneous regions. Surrogate iterative methods are employed to handle given subsampled data in transformed domains, such as Fourier or wavelet data. In this respect, this work extends the spatially variant regularization technique previously established in , which depends on the fact that the given data are degraded images only. Numerical experiments for the reconstruction from partial Fourier data and for wavelet inpainting prove the efficiency of the newly proposed approach. N. Buzun, A. Suvorikova, V. Spokoiny, Multiscale parametric approach for change point detection, in: Proceedings of Information Technology and Systems 2016 -- The 40th Interdisciplinary Conference & School, Institute for Information Transmission Problems (Kharkevich Institute), Moscow, pp. 979--996. K. Tabelow, Viele Tests --- viele Fehler, in: Besser als Mathe --- Moderne angewandte Mathematik aus dem MATHEON zum Mitmachen, K. Biermann, M. Grötschel, B. Lutz-Westphal, eds., Reihe: Populär, Vieweg+Teubner, Wiesbaden, 2010, pp. 117--120. H. Gajewski, J.A. 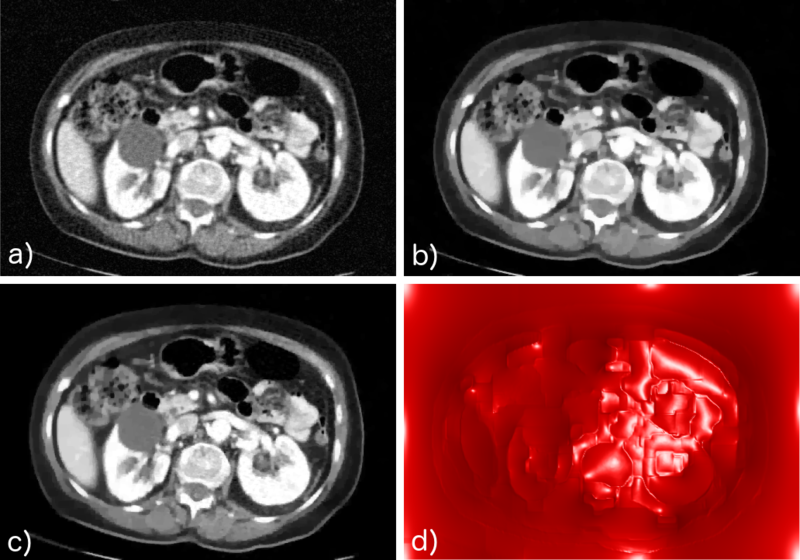 Griepentrog, A. Mielke, J. Beuthan, U. Zabarylo, O. Minet, Image segmentation for the investigation of scattered-light images when laser-optically diagnosing rheumatoid arthritis, in: Mathematics -- Key Technology for the Future, W. Jäger, H.-J. Krebs, eds., Springer, Heidelberg, 2008, pp. 149--161. M. Hintermüller, M. Holler, K. Papafitsoros, A function space framework for structural total variation regularization in inverse problems, MIA 2018 -- Mathematics and Image Analysis, Humboldt-Universität zu Berlin, January 15 - 17, 2018. M. Hintermüller, (Pre)Dualization, dense embeddings of convex sets, and applications in image processing, HCM Workshop: Nonsmooth Optimization and its Applications, May 15 - 19, 2017, Hausdorff Center for Mathematics, Bonn, May 15, 2017. M. Hintermüller, On (pre)dualization, dense embeddings of convex sets, and applications in image processing, Seminar, Isaac Newton Institute, Programme ``Variational Methods and Effective Algorithms for Imaging and Vision'', Cambridge, UK, August 30, 2017. M. Hintermüller, On (pre)dualization, dense embeddings of convex sets, and applications in image processing, University College London, Centre for Inverse Problems, UK, October 27, 2017. K. Tabelow, Adaptive smoothing of multi-parameter maps, Berlin Symposium 2017: Modern Statistical Methods From Data to Knowledge, December 14 - 15, 2017, organized by Indiana Laboratory of Biostatistical Analysis of Large Data with Structure (IL-BALDS), Berlin, December 14, 2017. K. Tabelow, High resolution MRI by variance and bias reduction, Channel Network Conference 2017 of the International Biometric Society (IBS), April 24 - 26, 2017, Hasselt University, Diepenbeek, Belgium, April 25, 2017. K. Tabelow, To smooth or not to smooth in fMRI, Cognitive Neuroscience Seminar, Universitätsklinikum Hamburg-Eppendorf, Institut für Computational Neuroscience, April 4, 2017. M. Hintermüller, Shape and topological sensitivities in mathematical image processing, BMS Summer School ``Mathematical and Numerical Methods in Image Processing'', July 25 - August 5, 2016, Berlin Mathematical School, Technische Universität Berlin, Humboldt-Universität zu Berlin, Berlin, August 4, 2016. K. Tabelow, Adaptive smoothing in quantitative imaging, In-vivo histology/VBQ meeting, Max Planck Institute for Human Cognitinve and Brain Sciences, Leipzig, April 13, 2016. N. Buzun, Multiscale parametric approach for change point detection, Information Technologies and Systems 2015, September 6 - 11, 2015, Russian Academy of Sciences, Institute for Information Transmission Problems, Sochi, Russian Federation, September 9, 2015. J. Krämer, M. Deppe, K. Göbel, K. Tabelow, H. Wiendl, S. Meuth, Recovery of thalamic microstructural damage after Shiga toxin 2-associated hemolytic-uremic syndrome, 21th Annual Meeting of the Organization for Human Brain Mapping, Honolulu, USA, June 14 - 18, 2015. H.U. Voss, J. Dyke, D. Ballon, N. Schiff, K. Tabelow, Magnetic resonance advection imaging (MRAI) depicts vascular anatomy, 21th Annual Meeting of the Organization for Human Brain Mapping, Honolulu, USA, June 14 - 18, 2015. K. Tabelow, To smooth or not to smooth in fMRI, Seminar ``Bildgebende Verfahren in den Neurowissenschaften: Grundlagen und aktuelle Ergebnisse'', Universitätsklinikum Jena, IDIR, Medical Physics Group, April 17, 2015. K. Tabelow, msPOAS -- An adaptive denoising procedure for dMRI data, Riemannian Geometry in Shape Analysis and Computational Anatomy, February 23 - 27, 2015, Universität Wien, Erwin Schrödinger International Institute for Mathematical Physics, Austria, February 25, 2015. K. Tabelow, High-resolution diffusion MRI by msPOAS, Statistical Challenges in Neuroscience, September 3 - 5, 2014, University of Warwick, Centre for Research in Statistical Methodology, UK, September 4, 2014. K. Tabelow, Assessing the structure of the brain, WIAS-Day, WIAS Berlin, February 18, 2013. K. Tabelow, Noise in diffusion MRI -- Impact and treatment, Strukturelle MR-Bildgebung in der neuropsychiatrischen Forschung, September 13 - 14, 2013, Philipps Universität Marburg, September 13, 2013. M. Welvaert, K. Tabelow, R. Seurinck, Y. Rosseel, Defining ROIs based on localizer studies: More specific localization using adaptive smoothing, 19th Annual Meeting of the Organization for Human Brain Mapping, Seattle, USA, June 16 - 20, 2013. S. Becker, Diffusion weighted imaging: Modeling and analysis beyond the diffusion tensor, Methodological Workshop: Structural Brain Connectivity: Diffusion Imaging---State of the Art and Beyond, October 30 - November 2, 2012, Humboldt-Universität zu Berlin, November 2, 2012. S. Becker, Revisiting: Propagation-separation approach for local likelihood estimation, PreMoLab: Moscow-Berlin-Stochastic and Predictive Modeling, May 29 - June 1, 2012, Russian Academy of Sciences, Institute for Information Transmission Problems (Kharkevich Institute), Moscow, May 31, 2012. K. Tabelow, Adaptive methods for noise reduction in diffusion weighted MRI -- Position orientation adaptive smoothing (POAS), University College London, Wellcome Trust Centre for Neuroimaging, UK, November 1, 2012. K. Tabelow, Functional magnetic resonance imaging: Estimation and signal detection, PreMoLab: Moscow-Berlin Stochastic and Predictive Modeling, May 31 - June 1, 2012, Russian Academy of Sciences, Institute for Information Transmission Problems (Kharkevich Institute), Moscow, May 31, 2012. K. Tabelow, Position-orientation adaptive smoothing (POAS) diffusion weighted imaging data, Workshop on Neurogeometry, November 15 - 17, 2012, Masaryk University, Department of Mathematics and Statistics, Brno, Czech Republic, November 16, 2012. K. Tabelow, Diffusion weighted imaging (DTI and beyond) using dti, The R User Conference 2011, August 15 - 18, 2011, University of Warwick, Department of Statistics, Coventry, UK, August 15, 2011. K. Tabelow, Functional MRI using fmri, The R User Conference 2011, August 15 - 18, 2011, University of Warwick, Department of Statistics, Coventry, UK, August 15, 2011. K. Tabelow, Modeling the orientation distribution function by mixtures of angular central Gaussian distributions, Cornell University, New York, Weill Medical College, USA, June 23, 2011. K. Tabelow, Statistical parametric maps for functional MRI experiments in R: The package fmri, The R User Conference 2011, August 15 - 18, 2011, University of Warwick, Department of Statistics, Coventry, UK, August 18, 2011. K. Tabelow, Structural adaptive smoothing fMRI and DTI data, SFB Research Center ``Mathematical Optimization and Applications in Biomedical Sciences'', Karl-Franzens-Universität Graz, Institut für Mathematik und Wissenschaftliches Rechnen, Austria, June 8, 2011. K. Tabelow, Structural adaptive smoothing fMRI and DTI data, Maastricht University, Faculty of Psychology and Neuroscience, Netherlands, September 28, 2011. K. Tabelow, Structural adaptive smoothing fMRI and DTI data, Workshop on Novel Reconstruction Strategies in NMR and MRI 2010, September 9 - 11, 2010, Georg-August-Universität Göttingen, Fakultät für Mathematik und Informatik, September 11, 2010. V. Spokoiny, Local parametric estimation, October 18 - 22, 2010, École Nationale de la Statistique et de l'Analyse de l'Information (ENSAI), Rennes, France. V. Spokoiny, Semidefinite non-Gaussian component analysis, Bivariate Penalty Choice in Model Selection, Deutsches Diabetes Zentrum Düsseldorf, June 17, 2010. K. Tabelow, A3 - Image and signal processing in the biomedical sciences: diffusion weighted imaging - modeling and beyond, Center Days 2009 (DFG Research Center scshape Matheon), March 30 - April 1, 2009, Technische Universität Berlin, March 30, 2009. K. Tabelow, Structural adaptive methods in fMRI and DTI, Biomedical Imaging Research Seminar Series, Weill Cornell Medical College, Department of Radiology & Citigroup Biomedical Imaging Center, New York, USA, June 25, 2009. K. Tabelow, Structural adaptive methods in fMRI and DTI, Memorial Sloan-Kettering Cancer Center, New York, USA, June 25, 2009. K. Tabelow, Structural adaptive smoothing in fMRI and DTI, Workshop on Recent Developments in fMRI Analysis Methods, Bernstein Center for Computational Neuroscience Berlin, January 23, 2009. N. Serdyukova, Local parametric estimation under noise misspecification in regression problem, Workshop on structure adapting methods, November 6 - 8, 2009, WIAS, November 7, 2009. V. Spokoiny, Adaptive local parametric estimation, Université Joseph Fourier Grenoble I, Équipe de Statistique et Modélisation Stochastique, Laboratoire Jean Kuntzmann, France, February 26, 2009. V. Spokoiny, Adaptive local parametric methods in imaging, Technische Universität Kaiserslautern, Fachbereich Mathematik, January 23, 2009. V. Spokoiny, Modern nonparametric statistics (block lecture), October 2 - 13, 2009, École Nationale de la Statistique et de l'Analyse de l'Information (ENSAI), Rennes, France. V. Spokoiny, Modern nonparametric statistics (block lecture), October 18 - 29, 2009, Yale University, New Haven, USA. V. Spokoiny, Modern nonparametric statistics (block lecture), January 13 - 16, 2009, École Nationale de la Statistique et de l'Analyse de l'Information (ENSAI), Rennes, France. V. Spokoiny, Parameter tuning in statistical inverse problem, European Meeting of Statisticians (EMS2009), July 20 - 22, 2009, Université Paul Sabatier, Toulouse, France, July 21, 2009. V. Spokoiny, Saddle point model selection, Université Toulouse 1 Capitole, Toulouse School of Economics, France, November 24, 2009. V. Spokoiny, Saddle point model selection, Workshop on structure adapting methods, November 6 - 8, 2009, WIAS, November 7, 2009. V. Spokoiny, Sparse non-Gaussian component analysis, Workshop ``Sparse Recovery Problems in High Dimensions: Statistical Inference and Learning Theory'', March 15 - 21, 2009, Mathematisches Forschungsinstitut Oberwolfach, March 16, 2009. K. Tabelow, A3 - Image and signal processing in medicine and biosciences, Center Days 2008 (DFG Research Center scshape Matheon), April 7 - 9, 2008, Technische Universität Berlin, April 7, 2008. K. Tabelow, Structure adaptive smoothing medical images, 22. Treffpunkt Medizintechnik: Fortschritte in der medizinischen Bildgebung, Charité, Campus Virchow Klinikum Berlin, May 22, 2008. K. Tabelow, Strukturadaptive Bild- und Signalverarbeitung, Workshop of scshape Matheon with Siemens AG (Health Care Sector) in cooperation with Center of Knowledge Interchange (CKI) of Technische Universität (TU) Berlin and Siemens AG, TU Berlin, July 8, 2008. K. Tabelow, A3: Image and signal processing in medicine and biosciences, A-Day des sc Matheon, Konrad-Zuse-Zentrum für Informationstechnik Berlin (ZIB), December 5, 2007. K. Tabelow, Improving data quality in fMRI and DTI by structural adaptive smoothing, Cornell University, Weill Medical College, New York, USA, June 18, 2007. K. Tabelow, Structural adaptive signal detection in fMRI and structure enhancement in DTI, International Workshop on Image Analysis in the Life Sciences, Theory and Applications, February 28 - March 2, 2007, Johannes Kepler Universität Linz, Austria, March 2, 2007. K. Tabelow, Structural adaptive smoothing in medical imaging, Seminar ``Visualisierung und Datenanalyse'', Konrad-Zuse-Zentrum für Informationstechnik Berlin (ZIB), January 30, 2007. K. Tabelow, Analyzing fMRI experiments with structural adaptive smoothing methods, BCCN PhD Symposium 2006, June 7 - 8, 2006, Bernstein Center for Computational Neuroscience Berlin, Bad Liebenwalde, June 8, 2006. K. Tabelow, Image and signal processing in medicine and biosciences, Evaluation Colloquium of the DFG Research Center sc Matheon, Berlin, January 24 - 25, 2006. K. Tabelow, Adaptive weights smoothing in the analysis of fMRI data, Ludwig-Maximilians-Universität München, SFB 386, December 8, 2005. K. Tabelow, Detecting shape and borders of activation areas infMRI data, Forschungsseminar ''Mathematische Statistik'', WIAS, Berlin, November 23, 2005. K. Tabelow, Spatially adaptive smoothing infMRI analysis, Neuroimaging Center, Cahrité, Berlin, November 10, 2005.